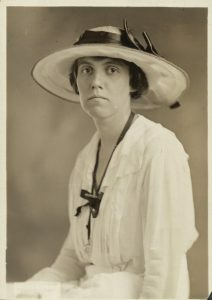 Mary Gertrude Fendall of Baltimore, Md., campaigned for the National Woman’s Party in the West in 1916 and was national treasurer of the NWP June 1917 to December 1919. She was the national organizer for the NWP in Oregon.She was a graduate of Bryn Mawr College. She holds the distinction of being the sergeant of the guard on the first day the NWP picketed the White House in January of 1917. She was often referred to as “the girl who managed the picket line” since one of her key duties while working for the NWP was enlisting women to picket. During the demonstration of March 4th, 1917 she provided a line of nearly a thousand. She was arrested and sentenced to three days in jail, January 1919, for applauding in court. Source: Doris Stevens, Jailed for Freedom (New York: Boni and Liveright, 1920), 358.